Fits all Mk1, Mk2 & 2.5 MX5 models 1989>2005, excluding Mk2 6 speed models after chassis number 214807 which require a different nylon cup. Mk1 1989>1998. Is your gear change getting notchy, stiff or sloppy?. Good condition - not too heavily scratched on aluminium top and leather is really good. It has been drilled and tapped with the correct thread to fit Mazda MX5 Mark 1 2 screw thread fitting. Simply unscrew your existing ball and screw this one on. Black #8 ball.Other colours available, see below. Part Number - DL4146030A. Genuine Mazda Gear Knob. Colour - Black Leather With Silver Shift Pattern. Mazda 2 (DE) 2010- Onwards. We're rated 5/5 for service! Dedicated Support. We're here to help whenever you need us. Will fit Mk1 Mk2 Mk2.5. The two middle fixings have been removed. Have photographed. 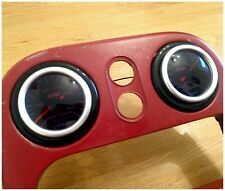 CP-e 3 pod Dash Gauge - Mazda 3 MPS. Condition is Used. Dispatched with Royal Mail 1st Class. MAZDA MX-5 MK3 (NC), (MIATA) 2005 - 2014. Motorcycle seat strap cover. VERY HIGH QUALITY CUSTOM MADE FITS PERFECT LIKE A GLOVE HANDCRAFTED WITH TOP GRAIN LEATHER. Steering Wheel Covers for Vans, Trucks, Classic Cars. Fits all Mk2 & 2.5 MX5 models, 1998>2005. Stainless Steel Scuff Plates, MX5 Mk2/2.5. 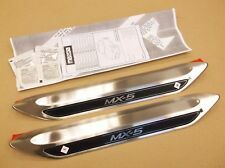 Genuine Mazda stainless steel accessory scuff plate set with the MX-5 logo emblazened into them. Fantastic quality, great looking, easy to fit, and all at our usual amazingly low price. VERY HIGH QUALITY CUSTOM MADE FITS PERFECT LIKE A GLOVE HANDCRAFTED WITH TOP GRAIN LEATHER. MAZDA MX-5 MK1, MK2 (NA, NB) ( MIATA ) 1990 - 2005. Motorcycle seat strap cover. Steering Wheel Covers for Vans, Trucks, Classic Cars. MAZDA RX8 2003 . Black leather with blue stitching. And what you will receive is only the leather part. 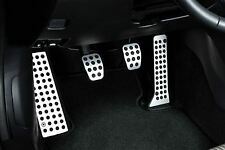 (Supplied inpairs these fit onto the headrests of the car. 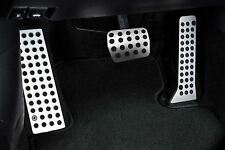 A must have for your Mazda (or MGB with Mazda seats fitted) ! 1) The tidyssolve the problem of the seat belt sliding up and down your neck or shoulder. MAZDA MX5 MK1 1990-1997. And what you will receive is only the leather part. Black leather with red stitching. Carnaby Blue Woven Fabric 9 PCE Seat Cover Set. This set includes 2x front seat covers, 1x 2-part rear seat covers, which allows the rear seat to be folded and 5x headrests. Machine Washable (40 degrees). MAZDA RX-7 MK3 1992-2002. And what you will receive is only the leather part. black leather red stitching. Motorcycle seat strap cover. VERY HIGH QUALITY CUSTOM MADE FITS PERFECT LIKE A GLOVE HANDCRAFTED WITH TOP GRAIN LEATHER. MAZDA MX-5 MK1, MK2 (NA, NB) ( MIATA ) 1990 - 2005. 100 % italian leather. Attractively Engraved as shown above. 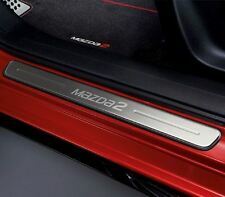 These Sill Protectors have been tailor made to fit Mazda 2 (third generation) from 2007 to 2014 (they will NOT fit the very latest model released in 2015). There are no tools required and no holes to drill. MAZDA MX5 MK1 MK2 MIATA 1989-2003. And what you will receive is only the leather part. Black leather with red stitching. MAZDA MX5 MK2 (MIATA) 1998 - 2005. Motorcycle seat strap cover. HANDCRAFTED WITH TOP GRAIN LEATHER. YOU WILL HAVE TO STITCH THIS COVER BY YOURSELF. MAZDA MX5 MK1 1990-1997. And what you will receive is only the leather part. FULL FITTING INSTRUCTION LACING CORD SWING NEEDLE. WITH TOP GRAIN LEATHER. 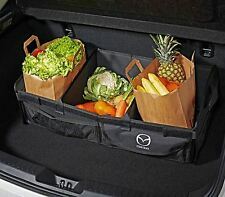 THIS COVER WILL FIT MAZDA 3. STEERING WHEEL COVER. OR WORN WITH REAL QUALITY LEATHER. THIS COVER ARE NOT UNIVERSAL ITS MADE TO FIT YOUR MODEL PERFECT. 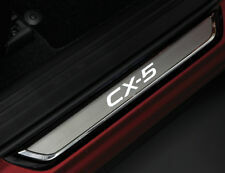 THIS COVER WILL FIT MAZDA RX8. FULL FITTING INSTRUCTION LACING CORD SWING NEEDLE. WITH TOP GRAIN LEATHER. STEERING WHEEL COVER. OR WORN WITH REAL QUALITY LEATHER. THIS COVER ARE NOT UNIVERSAL ITS MADE TO FIT YOUR MODEL PERFECT. Part compatibility: MAZDA MX-5 / MIATA / EUNOS MK1 (1989-1997) only. Material finish: Polished Aluminium. Material: Real Aluminium. You will buy the 5 rings only. The other parts shown on the pictures are not included. These are the real deal ! Simply unscrew your existing gear knob and screw your shiny new pool ball on in it's place. Mazda MX5 NA (1989 - 1997). Mazda MX5 NB (1998 - 2005). Mazda MX5 NC (2005 - 2015). MAZDA MX5 MK1 89-1998 . And what you will receive is only the leather part. dark red leather. MAZDA MK5 MK1 MK2 1989 TO 2005. And what you will receive is only the leather part. Motorcycle seat strap cover. RANGE ROVER. VERY HIGH QUALITY CUSTOM MADE FITS PERFECT LIKE A GLOVE HANDCRAFTED WITH TOP GRAIN LEATHER. 100 % italian leather. 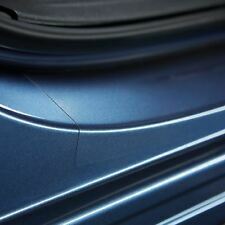 THIS COVER WILL FIT MAZDA 3 FROM 2003 - 2008. 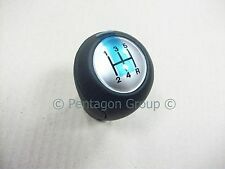 The gear knob is in great working condition with minor defects such as little scratches. You receive exactly what is presented within the images. FULL FITTING INSTRUCTION LACING CORD SWING NEEDLE. WITH TOP GRAIN LEATHER. THIS COVER WILL FIT MAZDA 3. STEERING WHEEL COVER. OR WORN WITH REAL QUALITY LEATHER. MAZDA RX8 2003-2012. Black pu suede with white stitching. And what you will receive is only the leather part. MAZDA RX8 2003-2012. Black leather with red stitching. And what you will receive is only the leather part. MAZDA MX5 MK1 1989 TO 1998. And what you will receive is only the leather part. MAZDA MIATA MX5 MK1 JDM MODELS ONLY 1989-1997. And what you will receive is only the leather part. the covers very easy to fit they have Velcro on the back for easy fitting. Black leather with red stitching. MAZDA MX5 MK3 MIATA 2005-2012. made from 100% genuine Italian leather,this is for the leather part only you will need to glue the cover to your plastic kit. Black leather with RED stitching. And what you will receive is only the leather part. And what you will receive is only the leather part. MAZDA 6 2008-2012. Black leather with red stitching. MAZDA RX8 2003 . Black leather with red stitching. And what you will receive is only the leather part. 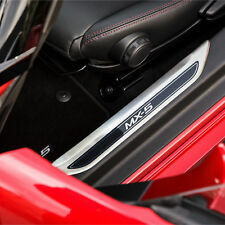 MAZDA MX5 MK1 1990 -1997. black leather red stitching. MAZDA MX5 MK3 MIATA 2005-2012. made from 100% genuine Italian leather,this is for the leather part only you will need to glue the cover to your plastic kit. Black leather with white stitching. And what you will receive is only the leather part.